Upper Street Gallery, London College of Communication, Elephant and Castle, London SE1 6SB. Directions. Free, please RSVP to l.h.hall@lcc.arts.ac.uk. A listening event organised in conjunction with the publication of Colloquium: Sound Art and Music published by Zero Books September 2016, edited by Thomas Gardner and Salomé Voegelin, with contributions from Allen S. Weiss, Nye Parry, David Toop, Volkmar Klien, Aura Satz, Leigh Landy, Cathy Lane, Simon Emmerson, Claudia Molitor and Kathy Hinde, with a postscript by Kate Lacey. The event will take place in the Upper Street gallery at London College of Communication, featuring work by Kathy Hinde, Volkmar Klien, Cathy Lane, Claudia Molitor, Nye Parry and David Toop. The evening will serve as an informal platform to continue the aim of the book, to make the relationship between sound art and music “colloquial”: spoken and accessible through dialogue and the practice of a collective listening. The publication will be available to purchase on the night for a discounted price of £10 (cash only). Please bring something soft to sit on. A limited number of chairs will be provided for those who might need them. 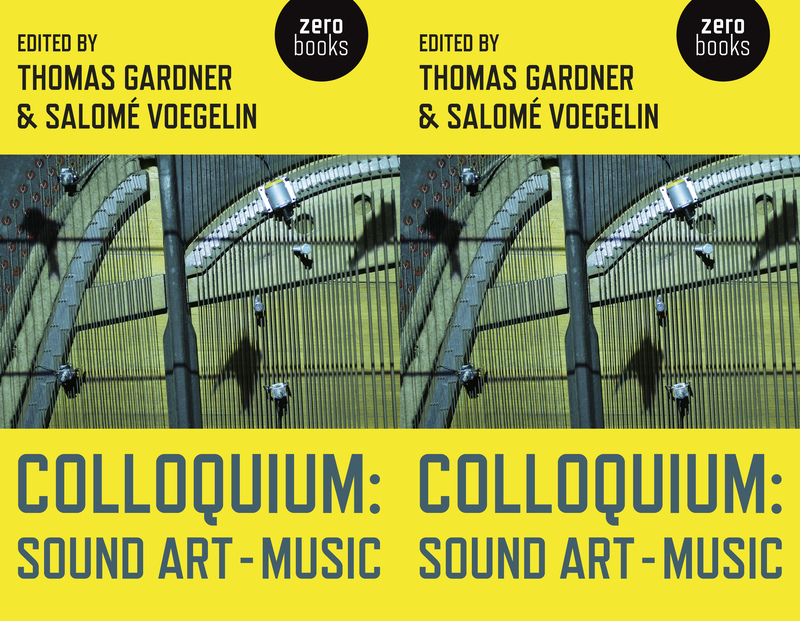 About the book: Colloquium: Sound Art – Music Thomas Gardner and Salomé Voegelin eds, Winchester, Washington: Zero Books, 2016, pp217. In 2012, Thomas Gardner and Salomé Voegelin hosted a colloquium, entitled “Music – Sound Art: Historical Continuum and Mimetic Fissures”, at the London College of Communication, UAL. This colloquium dealt with the current debate concerning the relationship between sound art and music. This book opens the colloquium to a wider readership through the publication of a decisive range of the material that defined the event. It includes the transcripts of the original colloquium discussions, the provocations that initiated its debates as well as responses to its themes written after the event. It aims to raise some pressing and relevant questions without providing answers and open up the continuum between concert hall and gallery space, between record collection, radio, sound on-site, online and the everyday.